Aunt Dimity Slays the Dragon is the fourteenth installment of Nancy Atherton 's much loved Aunt Dimity cozy mystery series. In this particular novel, a Rennaissance Fair lands itself in Finch -- coincidentally right in the backyard of our beloved protagonist Lori Shepherd. When it appears that murder is being attempted on "King Wilfred" because of the attention he bestows on a beautiful young singing maiden, Lori interferes in order to prevent those endangered from meeting their demise. As always, Lori consults with Aunt Dimity from the supernatural world beyond, using the magic journal in her study to determine what her next moves will be in saving the village of Finch. I really love how Atherton has veered away from actual murders and dead bodies and instead, presents a quaint, mellow mystery without involving severe violence or loss. To me, this is the epitome of a true cozy mystery. I particularly enjoyed Aunt Dimity Slays the Dragon also because for once, Lori's flirtations are directed toward her husband Bill and not toward a new stranger temporarily staying in town! It's about time you set this up, Nancy Atherton -- THANK YOU! I'm so relieved that Lori is as surprised by Bill's sexiness as readers are surprised she's not flirting with outside parties, ha! Knowing that the author resides in Colorado Springs presently at the time of this writing, I wonder if Atherton was inspired by the infamous Rennaissance Festival that resides in Larkspur, Colorado. Having had the pleasure of attending the Larkspur festival myself numerous times, I definitely noticed some similarities. What a brilliant and fun idea for an Aunt Dimity mystery novel! 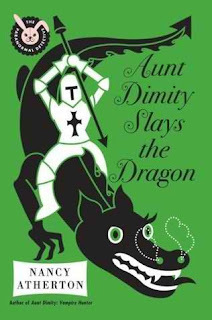 The next Aunt Dimity novels in the series are Aunt Dimity Down Under (2010) and Aunt Dimity and the Family Tree (2011), which will be released later this month.